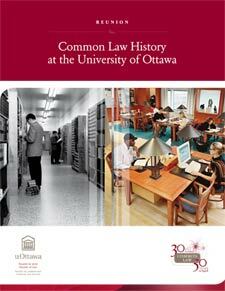 Welcome to Reunion: Common Law History at the University of Ottawa. Here you will find a history of the University of Ottawa’s Common Law Section divided into areas based on its deans as well as two of our unique programs—the French Common Law Program and the National Program. Encompassing hundreds of hours of archival research and dozens of interviews with alumni, faculty and staff, Reunion strives to capture the flavour of those bygone days when it was very easy to get into the law school, but very difficult to graduate. In addition to the strict behavioural standards, closed-book exams, and inadequate facilities, the story touches on the experiences of the first women who attended the law school, the efforts to support equity-seeking groups in successfully completing law school as well as program changes. Although successful students worked very hard, they also had many recreational outlets in the early days of the law school—intramural sports, law luncheon speakers like the Rt. Hon. John Diefenbaker, and the annual Law Ball. Some student-led initiatives, such as the Legal Aid Clinic have endured since their original founding; others, such as the Law House—a student recreational club and residence—have since faded from the law school’s consciousness.